Lancashire left-hander Ashwell Prince was pleased to start the season with a century, albeit in a losing cause. Prince was the last man dismissed for 100 as the Division Two champions lost by 45 runs at Nottinghamshire. "It's nice to get a score in the first match of the season. It's April and it's not easy to bat," said Prince. "Having said that, it was a good pitch for batting. The sunshine flattened the pitch out and it was a nice pitch to bat on," he told BBC Radio Lancashire. 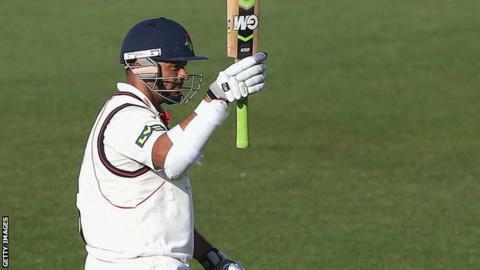 Lancashire were 112-6 chasing a victory target of 349, but a seventh-wicket stand of 147 between former South Africa Test batsman Prince and all-rounder Tom Smith, who made 76, brought the visitors back into contention. Prince was later joined at the crease by number 11 batsman James Anderson, who survived for around 30 minutes before Prince was bowled by Harry Gurney. "It's disappointing to lose the match, but you try and take the positives," added the 36-year-old, who has announced he will retire at the end of the season. "The way we fought with the ball to get those last wickets - we knew we had to bowl them out to have any chance of winning the match. "We also knew that if we had a few good partnerships, we could get the score. "Their bowlers were getting tired and Jimmy and I felt we had a good chance of seeing it off." Lancashire's next Division One game, a home fixture against Warwickshire, starts on 20 April.